Today is Veterans Day in America, where thanks are given to all servicemen past and present. In the UK, 11th November is Remembrance Day, where we commemorate the dead (Memorial Day in the U.S.). The main ceremonies now take place on the Sunday nearest to the 11th, but for two minutes on the 11th itself, at 11am, the UK grinds to a halt. Phones are left ringing, radios crackle with empty static, children in playgrounds stand still and bow their heads. 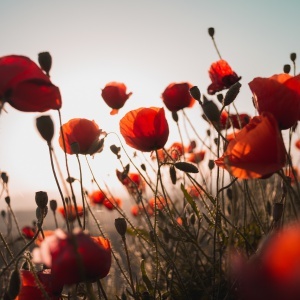 The eleventh hour of the eleventh day of the eleventh month is the exact moment at which the First World War ended and the soldiers on both sides lay down their weapons. Last year marked the centenary of the outbreak of WWI (1914-1918). To commemorate the occasion, the Tower of London was given over to an art installation: Blood Swept Lands and Seas of Red. Starting on the 17th July (and first unveiled to the public on 5th August, the anniversary of the date Britain entered the war), red ceramic poppies began to appear on the Tower. As the days went on, they trickled, and then poured from the windows, down the walls, and spread ever-wider around the base until they’d filled the moat. On Remembrance Day, the 888,246th poppy was planted: one for every British military life lost during the First World War. I’m a closet genealogy geek, and I’ve traced most of my immediate and extended family back beyond both World Wars. My family tree is fortunate in having only one combat casualty: a distant cousin buried in a field in France. The Pals Regiments, introduced at the start of the war, kept local groups together and usually resulted in an entire generation of a town’s men being wiped out overnight. One other distant relative lost a leg, but as he did so falling from a barracks window while horsing around with another soldier, I don’t think he really counts as a war hero. One of the Tower poppies came to America with me: they were sold to the public, raising £10 million for six military charities. Two parts of the installation, the Weeping Window and the Wave, were donated to the Imperial War Museums in London and Manchester. While today people around the world are commemorating those who paid the ultimate price in defence of their country, we should remember that war itself is a bloody, vicious thing. The best way we can honour those who died for our sakes is to stop adding to their number.